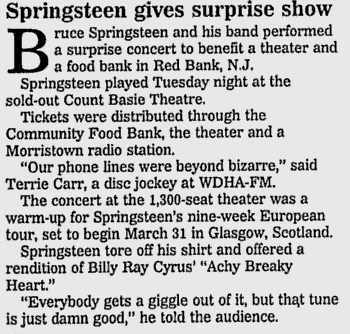 Bruce covered the song only once in 1993, apparently played in a spur of the moment, Requested by someone shouting in the audience. Don Von Tress wrote the song in 1990. The song was initially to be recorded by The Oak Ridge Boys in the early 1990s but the group decided against recording it after lead singer Duane Allen said that he did not like the words "achy breaky". 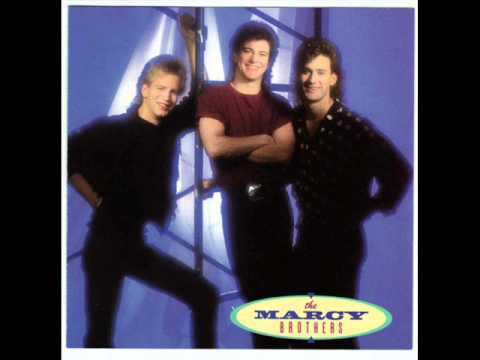 It was then recorded in 1991 under the title "Don't Tell My Heart" by The Marcy Brothers, although their version changed some lyrics. Billy Ray Cyrus heard Von Tress's version of the song, and chose to include it on his debut album Some Gave All in 1992. The song is Cyrus' debut single and signature song, it made him famous and has been his most successful song. someone : "Achy Breaky Heart!" (laughs) Like that song....that’s, that’s like telepathic "cause I was thinking of doing the song ....laying in bed the other night....I said "What would really bend everybody’s minds.....Achy Breaky Heart’..."